This article is about Chapter 7-1. For the beveragarium in Flipside, see The Underwhere (bar). The Underwhere is the setting of chapter seven in the game Super Paper Mario. It is also called World -1 by one of the residents, a reference to the famous "Minus World" glitch from the original Super Mario Bros.. Ruled by Queen Jaydes, The Underwhere makes up one half of the "afterlife" dimensions, and is where people who have been neither good nor bad from "all worlds" go when they die. Once there, the people become ghost-like creatures known as Shaydes (a corruption of the word "Shades"). As the Underwhere is not a place of suffering and pain, just boredom and dullness, it should be compared to the Asphodel Meadows of the ancient Greek underworld, rather than the multi-regional Hell. Queen Jaydes herself was named for the Greek god of the underworld, Hades, and there are numerous other aspects of The Underwhere taken from Greek mythology (listed below). However, the Underwhere's counterpart, The Overthere, where the sinless can spend eternity as angelic Nimbis, is more heavily based on Heaven than the Greek Elysian Fields. Bonechill's prison, the place where people go when they have been very bad in life, is equivalent to Tartarus, also from Greek mythology, although the fact that he was a fallen Nimbi and his association with ice does bear resemblance to the story of Lucifer, who, according to Dante's Inferno, is trapped in ice in the deepest circle of Hell. (Chapter 7-1: Subterranean Vacation) A dark, dull dimension filled with strange creatures. Queen Jaydes rules this land. This area is visited during Chapter 6's interlude. Mario finds Luigi and has the previous world's Pure Heart restores, but loses Bowser and Peach. The Bros. then return here for Chapter 7's first level and are tasked with escorting Luvbi to The Overthere. (Chapter 7-2: The Sealed Doors Three) The way to the Overthere Stair. This level requires the player to move upward. Three Dorguy challenges must be completed and much backtracking is required. Bowser is fought here and rejoins the party. (Chapter 7-3: The Forbidden Apple) A blue-skied area consisting of hundreds of clouds. Like the previous level, the heroes must ascend vertically. Many apples with magical effects are found here. Princess Peach rejoins the party after being awakened. (Chapter 7-4: A Bone-Chilling Tale) The kingdom of Grambi and the Nimbis, which is under attack by Skellobits. Bonechill is fought as the Chapter Boss. Mario meets Luvbi for the first time. After Mario, Princess Peach, and Bowser "had their games ended" by Dimentio from Flipside, Mario awakens near the The Underwhere fountain without any of his Pixls, while Princess Peach and Bowser are nowhere to be found. A Shayde approaches him and tells Mario about the Underwhere, where people with ended games go. When Mario rejects the claim that his game has ended, the Shaydes tells him to go to Queen Jaydes to "weigh his sins". The first area contains The Underwhere fountain, which fully restores Mario's HP. There several Shaydes, a Save Block, and a door to the next area. Mario does not go far before he is stopped by Luvbi, a Nimbi, who hopes to meet her "special someone". She disregards Mario as being a "mustachioed fatty" and ignores him. This area includes several, spikes, pits and tall pipes, too high to jump. Mario must find a winding path in 3-D to pass this area. Many Dry Bones are found here. At the end of the path is a door, as well as a Super Shroom Shake on top of a pipe, which can be reached with a flipping block. Mario then reaches the River Twygz. He may either pay Charold four coins to ferry the river or simply swim across. On the other side of the river is Queen Jaydes's palace. Once there, Jaydes starts weighing his sins, but then feels "strange energy" emitting from Mario. Mario shows Queen Jaydes the stone, powerless Pure Heart obtained in the World of Nothing and she begins questioning Mario about how he obtained it. A phone call from Grambi of The Overthere interrupts her, informing her of their missing daughter, Luvbi. With her and her D-Men busy, Jaydes entrusts the task of locating Luvbi to Mario. Jaydes then takes the Pure Heart for the time being and gives Mario the key to the tunnels under the River Twygz, stating that she was notified of a "strange fellow dressed in green" who has fallen into the river. She asks Mario to check there first. Mario swims to the bottom of the river, avoiding several Underhands, and finds a secret tunnel in 3-D, leading to the locked door his key is for. The door leads to an underwater room with an Underhand next to a pillar with a block on top of it. On the other side of the pillar is a lever that drains the water in the room and some Brick Blocks blocking the way ahead. As the blocks cannot be broken underwater, Mario must push the block off the pillar, drain the water, then use the block to reach the bricks and destroy them so he can swim ahead. Mario reaches a dead end, but finds a path in 3-D to a large room. There is a path in 3-D, but it is blocked by Underhands. Mario must go to the other side of the room, shove down another pushable block in an alcove, then drain the water with a lever to make the Underhands disappear. He can then take the path and enter a room with a pipe and a door. The pipe leads to a room with several coins. The door is the way ahead. Mario eventually reaches an outside area. Crossing several fountains, he finds Luigi, who was sent there by Dimentio after Chapter 6. He doesn't remember anything that happened since he was hypnotized by Nastasia into Mr. L. Mario explains that he has arrived in The Underwhere and asks Luigi to help him find Luvbi. Luigi eagerly accepts and joins Mario's party. The Bros. must make their way back to the second room in the level. Luigi's super jump can be used to clear the pipes. At the left end of the room, the super jump must be used to reach another floor. There are some Dry Bones and Frost Piranhas here, as well as a door leading to another area. One of the pipes leads into the background, where there is pipe leading to an underground area with a Gigabite, which awards the player with Peach's third Catch Card when defeated. In the next area, there are many pipes, each with a Frost Piranha inside. At the edge of the area is Luvbi. She is still searching for a prince and growls when the Bros. approach. After learning that they came to find her and bring her home, she asks them her name. When they answer correctly, she flies back to Jaydes in shock. The Bros. follow and Jaydes thanks them for finding Luvbi. She gives Mario the Pure Heart, which she was able to revitalize. She then tells them that their games were never ended and they were simply sent to The Underwhere. She asks them if they would like to return to Flipside and they agree. Merlon and Tippi met up with Mario and Luigi at Flipside Tower. At Merlon's house, Mario explains what happened and introduces Luigi. 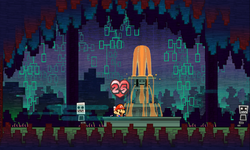 With the Pixls back, they placed the revitalized Pure Heart into the seventh Heart Pillar in Flopside B1 Outskirts, revealing the purple door. Once they are ready, they enter the door on Flipside Tower but find that they are back in the Underwhere. He had reunited with Luigi, yes, but Peach and Bowser were still missing. Just where were those two? And what new dangers lay ahead? It was time to venture through the door opened by the seventh Pure Heart. The group venture towards Queen Jaydes's palace once more. Surprised, Queen Jaydes asks why Mario and Luigi have returned. Tippi explains that they are trying to find the Pure Heart hidden in The Underwhere. After realizing that they are the heroes mentioned in the Light Prognosticus, Jaydes tells them that the Pure Heart's location is top secret and the heroes will need to consult with Grambi in The Overthere. At that moment, Luvbi arrives, ready to return to The Overthere. Queen Jaydes asks the heroes to accompany Luvbi to The Overthere, as a monster has recently escaped from The Underhwere and Luvbi needs protection. Mario and company accept the task, hoping to speak to Grambi when escorting Luvbi, and Queen Jaydes opens the way to Underwhere Road. Through the door is the Star Block, which ends the chapter. "Jaydes rules the sad souls whose games are over. Mario and his brother Luigi finally reunited here. After that, they headed with Luvbi up to The Overthere." In The Underwhere and its counterpart, The Overthere, many characters or places that are encountered are references to other things, in most cases the names are specifically based off of Greek Mythology. Shayde, a corruption of Shade. Jaydes, a corruption of Hades. The Underwhere itself, a corruption of The Underworld. The River Twygz (twigs), a corruption of the River Styx (sticks). D-Man, a corruption of Demon. Charold, the man who runs the ferry across the River Twygz, is a corruption of Charon. Underchomp, a reference to Cerberus (both act as three-headed dogs who guard the gates to the underworld). Hagnes, Hagitha, and Hagra reference the Fates. A "beveragarium" that serves milk beneath Flipside is named "The Underwhere"; another one in Flopside is named "The Overthere." This is the only chapter where none of Count Bleck's minions are fought. This page was last edited on March 4, 2019, at 14:35.